Building on Seymour Duncan's original Shape Shifter, it s now significantly smaller and features stereo inputs and outputs, Phase control between outputs and an expanded rate range, while a blinking LED knob (like the one found on the Vapor Trail analog delay) gives you a visual representation of the tempo, and stays engaged even when the unit is in bypass so you can alter the rate in between parts of your song. The Shape Shifter provides a natural, first-class sound that is rich, authentic and highly customizable. Wave, Shape, Depth, Speed and Tap Tempo controls allow you infinite ability to craft your own unique signature Tremolo tones, while the Phase control lets you adjust between left and right output channels to find the ideal mix. Whether you re looking for the classic shimmer heard on many hits or some truly mind-blowing severe helicopter chops, piano stabs or backwards swells, the Shape Shifter can do it. True stereo inputs and outputs allow the Shape Shifter to be used in both live and studio applications for all types of instruments. 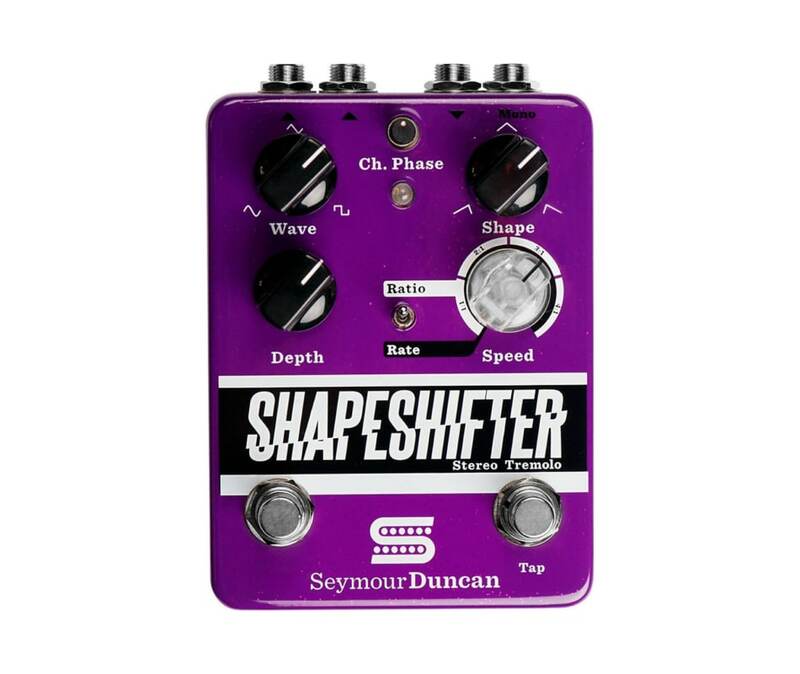 The Shape Shifter joins the Seymour Duncan guitar pedal lineup with the Dirty Deed, Pickup Booster, Vapor Trail and 805 Overdrive - each pedal is true-bypass and assembled at the Seymour Duncan Factory in Santa Barbara, California.